More than 30 years later, he's still making title belts in his rural Alabama home, but the quality has gone up dramatically. Instead of cardboard and cheap tin, now Millican creates the gold-plated belts used by World Wrestling Entertainment (WWE) on their television and pay-per-view programs. "Most of the belts on WWE television are mine," Millican said. "From the WWE title, the World Heavyweight Championship, big gold belt [to] the Intercontinental title." It keeps Millican busy. Each WWE champion gets at least two belts -- one that they travel with and one that's only used for televised events. Aside from WWE, Millican makes belts for collectors and smaller wrestling and mixed martial arts promotions. "I would say we probably turn out between 60 and 70 belts a year," Millican said. "I send belts all over the states. I do a lot of business in Canada and Japan with collectors." Millican grew up in the 1970s in the Memphis area where two kings reigned: Elvis Presley and pro-wrestler Jerry 'The King' Lawler. Lawler earned his moniker by dominating the Memphis wrestling scene and gained notoriety for his series of matches with comedian Andy Kaufman. "If you grew up in the Memphis area, you better have a Jerry "The King" Lawler t-shirt in your closet because otherwise you could get fined in that state," Millican said. Millican's love of pro wrestling and the belts never waned. He made belts for small wrestling companies on the side while working as a corrections officer and eventually got the attention of Reggie Parks, who was the big belt maker for the industry from the 1960s to the mid-1990s. 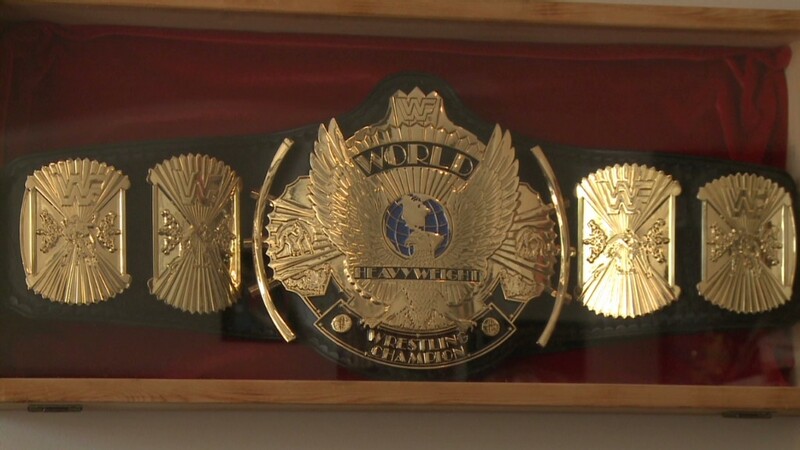 Millican originally came to Parks to buy a replica belt for himself, but Parks took him under his wing and showed him how to make those used by companies like World Wrestling Federation and World Championship Wrestling. Making a championship belt can be a tedious process. Millican sets the metal plates onto the leather by hand in his garage, and brushes on layers of gold finish on his kitchen counter. He doesn't have any employees but does use specialists for some parts of production. The more basic belts can be made fairly quickly, but those for WWE are much more ornate. "A single layer belt is something that we can typically turn out production time in a couple of weeks," Millican said. "Whereas you might actually spend months on something like the current WWE title, which has 630 [cubic zirconia] stones set into the baseplates." Millican's job doesn't come with an obvious retirement plan, but he's increasingly making money off of licensing deals. He gets a fee every time his belts appear in a WWE video game or on a WWE toy. And he's already started grooming the next Dave Millican, taking fellow belt maker Mike Nicolau under his wing much like Reggie Parks did for him.